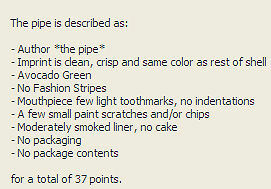 The value of pipe #254 is 37 points. Paul Zolig says he is a frequent visitor to the pages and, when he saw this pipe being offered on eBay by Judd Perlson, Paul was kind enough to let me know about it. I was lucky enough to win the bidding and now have this pipe in the collection. I got a better bowl with another pipe, so I took this one's mouthpiece and put it on the new one and put this pipe on the Pipes for Trade page. I traded it to Larry Buys for all his kindnesses.